NEW YORK: China’s “One Belt, One Road” project, of which China-Pakistan Economic Corridor is a part, will bring economic prosperity to all nations through regional connectivity, Pakistan’s Ambassador to the United Nations, Maleeha Lodhi, has said. “We in Pakistan view the Chinese initiative as the most important 21st century enterprise,” she said in an interview with Xinhua, China’ state-run new agency. The mega, $46 billion project with 3,000 kms of roads, railways, pipelines and infrastructure programmes will connect China’s Kashghar in Xinjiang province with Pakistan’s Gwadar port. It is expected to help improve the lives of billions of people in China, South Asia and Central Asia, who would benefit from the economic corridor. CPEC is set to be completed in three phases by 2030.
the actual, working Iran nuclear deal, known by the ungainly acronym JCPOA, is at the heart of it. … And faithful to the slowly evolving Eurasia integration roadmap, Russia and China are at the forefront of supporting Iran. Iran will not renegotiate a 2015 nuclear deal with major powers, Iran’s foreign minister said on Thursday, as a deadline set by U.S. President Donald Trump for Europeans to “fix” the deal loomed. PARIS/BRUSSELS (Reuters) – European powers still want to hand Donald Trump next week a plan to save the Iran nuclear deal, but they have also started work on protecting EU-Iranian business ties if the U.S. president makes good on a threat to withdraw, six sources told Reuters. Because its frozen assets were released, Iran has little incentive to renegotiate, or even stick to, the nuclear deal. The USA should realize that by now. As far as Iranian trade goes, Iran has indicated that it wants to join the EAEU (Eurasian Economic Union), a Russia-dominated trade union. Presuming it does, Iran would be the first nation to join that was not part of the old Soviet Union. That may get other nations, including some that were in the old Soviet Union, to consider that the EAEU may be for them as well. Before going further, let me point out that despite what certain Protestant writers claim, we in the Continuing Church of God do not believe that Iran is about to align with Russia to fulfill Ezekiel 38 (two related videos are available titled Ezekiel 38: For Russia, Ukraine, & Iran Now? and Russia, Iran, Syria, & the Bible (Code)). Although there is cooperation with various nations, the time period for Ezekiel 38 is AFTER Jesus returns, not before (see also Ezekiel 38: For Russia & Iran in Our Day?). 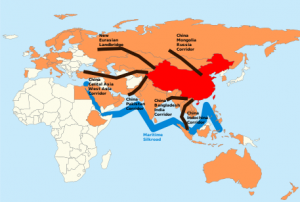 But what about China’s One Belt, One Road Initiative, also known as the Silk Road Project? And parts are intended to be finished by 2030. We could well see the gathering at Armageddon by then AND have the Chinese ‘roads’ (some are actually shipping ports) used to transport soldiers and military equipment to gather at Armageddon. For them to gather, they must cross over land to get to Armageddon. The Silk Road project will make that easier. The world order is in the process of realigning. As Jesus said: “And what I say to you, I say to all: Watch!” (Mark 13:37). This entry was posted on Thursday, May 3rd, 2018 at 3:00 pm	and is filed under Prophecy.